The statue of six children dancing around a crocodile became famous worldwide due to several pictures that a Soviet photographer took after the German army’s devastating bombings. 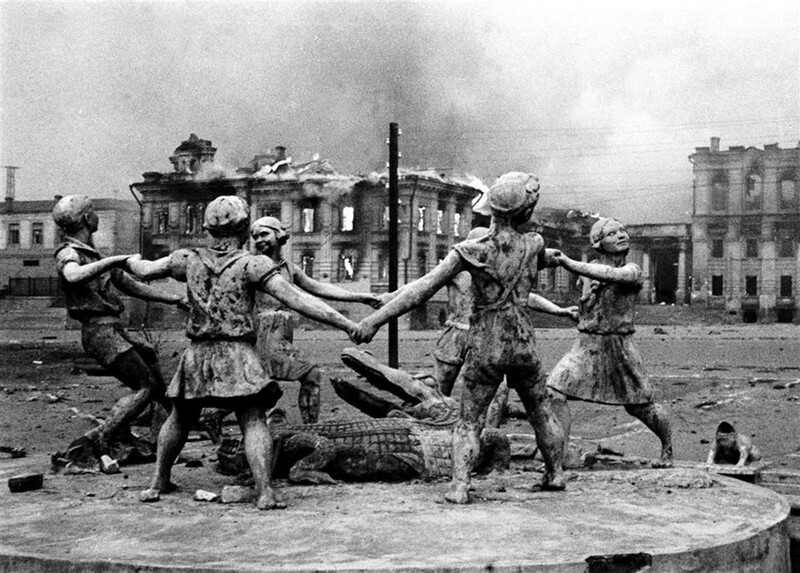 A picture of the fountain taken by Emmanuil Yevzerikhin on August 23, 1942, conveyed the devastation of the Battle of Stalingrad by juxtaposing a pastoral scene of children dancing around a playful crocodile and the city’s bombed-out, burning buildings in the background. On the day the photograph was taken, about 40,000 civilians lost their lives to Nazi air strikes, according to official statistics. The Battle of Stalingrad was one of the bloodiest battles in history, with combined military and civilian casualties of nearly 2 million. The Evzerikhin’s most famous image is a grim scene of a fountain at the center of Stalingrad. The subject of this classic image of children dancing the khorovod, a circle dance common in Russia, once might have projected innocence and normal life in the center of Stalingrad. The children’s fountain stood in the square just in front of Stalingrad’s main train station, greeting arriving visitors with its message of an exuberant future. Evzerikhin’s photograph turned that image of innocence upside down and turned the fountain into a commentary on war. In the background is a city now in flames and littered with rubble, devastated by months of bombing. The city square, once bustling with pedestrians, is empty. What dominates the center of the frame are “children” engaging in leisure time activity, but it seems that the only children who have survived the war are made of concrete and placed around a fountain. In Evzerinkhin’s apocalyptic vision, life as we know it has ended. Officially named the Children’s Khorovod, literally “Children’s Round Dance”, the fountain initially installed in 1939 and was based-on a fairy-tale poem by Korney Chukovsky (1882-1969). The fountain was restored after World War II and was removed in the 1950s. A replica has been installed at the original site, for the 23 August 2013, for the 71st anniversary of the Battle of Stalingrad. They indeed surrounded the gator. Best way to win a war - surround the enemy - control their supplies.